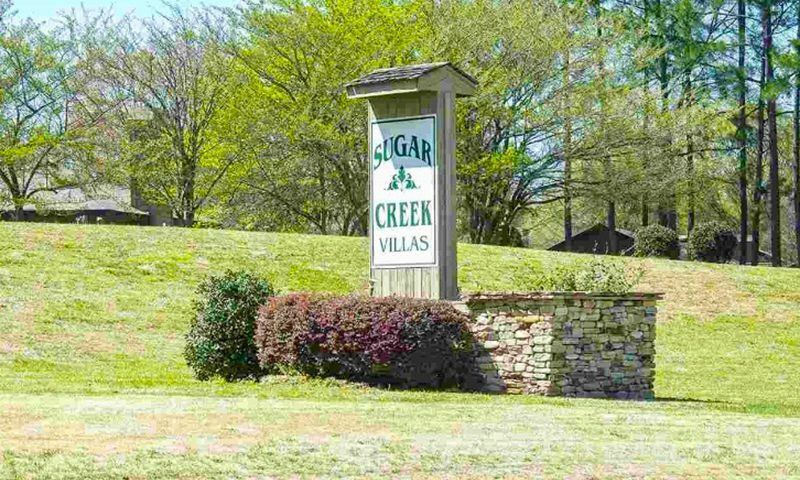 Sugar Creek Villas is an active lifestyle community in Greer, South Carolina. This neighborhood has low-maintenance homes, charming amenities, and welcoming atmosphere. With just 160 residences, homeowners can easily mingle with their neighbors, making it a close-knit and friendly environment. The clubhouse in Sugar Creek Villas is the central hub of physical activity and social recreation. Residents can mingle in the multi-purpose room for casual get-togethers. They can also hang out by the card tables for a fun game night with friends. Outdoors, homeowners can take a dip in the swimming pool or lounge on the patio on a warm, sunny day. Neighbors can challenge each other to a friendly game on one of the two tennis courts. They can take leisurely strolls along the neighborhood's walking and biking trails. With plenty of parks and natural space, residents can also enjoy some fresh air while appreciating the community's picturesque setting. Sugar Creek Villas was built between 1963 and 1992 by NHE. This established community consists of 160 attached and single-family homes within a quiet and natural setting. All homes are low-maintenance and also include landscaping in the monthly homeowners' association (HOA) fee. Attached homes offer approximately 1,000 to 1,814 square feet of living space. They have two or three bedrooms, two or two-and-a-half bathrooms, and an attached one or two-car garage. Some homes feature open layouts, vaulted ceiling in great rooms, formal dining areas, spacious bedrooms with walk-in closets, storage space, and private patios. Homebuyers who want more space can choose from a variety of resale single-family homes. These residences range in size from approximately 1,000 to 1,940 square feet and have two or three bedrooms, two or three bathrooms, and an attached two-car garage. They typically feature open layouts, hardwood floors in the main living areas, carpeting in bedrooms, updated kitchens, large great rooms, separate laundry rooms, and outdoor patios. Residents thoroughly enjoy living in this carefree community. Thanks to the HOA that takes care of landscaping and exterior home maintenance, residents have more time to pursue new interests. They can start a tennis league or card club with other like-minded adults. They can also attend community events or holiday parties to meet new neighbors and build lifelong friendships. Sugar Creek Villas is a fun place to relax and socialize any day of the week. Ideally situated within the Greenville area, active adults will be close to daily conveniences, attractions, and outdoor recreation. Homeowners will find Eastgate Shopping Center nearby as well as plenty of worship centers, a CVS Pharmacy, grocery store, bank, fast food chains, and local restaurants. Golfers can play their next game at Greenville Country Club that's 25 minutes away. Major roadways like Interstate 85 and Highway 14 are close by for cross-town travel. When traveling farther is necessary, Greenville-Spartanburg International Airport is just 13 minutes away. Sugar Creek Villas is a charming active lifestyle community in Greenville County, SC. There are plenty of activities available in Sugar Creek Villas. Here is a sample of some of the clubs, activities and classes offered here. Attached homes offer approximately 1,000 to 1,814 square feet of living space. They have two or three bedrooms, two or two-and-a-half bathrooms, and an attached one or two-car garage. Some homes feature open layouts, vaulted ceiling in great rooms, formal dining areas, spacious bedrooms with walk-in closets, storage space, and private patios. Please Note: Floor plans are not available at this time. Homebuyers who want more space can choose from a variety of resale single-family homes. These residences range in size from approximately 1,000 to 1,940 square feet and have two or three bedrooms, two or three bathrooms, and an attached two-car garage. They typically feature open layouts, hardwood floors in main living areas, carpeting in bedrooms, updated kitchens, large great rooms, separate laundry rooms, and outdoor patios. Please Note: Floor plans are not available at this time. 55places.com is not affiliated with the developer(s) or homeowners association of Sugar Creek Villas. The information you submit is distributed to a 55places.com Partner Agent, who is a licensed real estate agent. The information regarding Sugar Creek Villas has not been verified or approved by the developer or homeowners association. Please verify all information prior to purchasing. 55places.com is not responsible for any errors regarding the information displayed on this website.